Gary D. Rhodes excavates the cinematic sepulcher of Ed Wood's unproduced scripts for Bela Lugosi, The Vampire's Tomb and The Ghoul Goes West. Joining Rhodes on the expedition are pith-helmeted horror movie expert Tom Weaver, plus Lugosi's original biographer Robert Cremer. An amazing collection. This book frames Wood's work. Wood invariably worked with infinitesimal budgets, shooting at breakneck speed, incorporating plot twists that defied all logic. FOR MUCH MORE DETAIL, CLICK IMAGE. Poe's complete short-stories, including The Fall of the House of Usher, Murders in Rue Morgue, Tell-Tale Heart, Ligeia and more. Early poetic masterpieces like The Raven, Ulalume, Annabel Lee, Tamerlane and reviews and narratives. 842 pages! Hardcover with dust jacket. New! By Frederick Wiebel. 275 pages of solid information, history, photos, and advertising artwork on Thomas Edison's FRANKENSTEIN film. Thought lost for years, this is the story of the rediscovery and historic impact of this film by THE authority on it, Fred Wiebel. Fascinating! Recommended. A graphic adaptation of the lost American classic film by Chris Yambar, Robb Bihun and Frederick Wiebel, Jr. A black and white comic styled horror, with fabulous art. Plus the history of the Thomas Edison film by researcher Wiebel. 62 pages. Note: personalized autograph from Wiebel. The complete illustrated history of RANKIN/BASS PRODUCTIONS. ARTHUR RANKIN, JR. and JULES BASS have Produced many, many Holiday television classics such as RUDOLPH THE RED-NOSED REINDEER, FROSTY THE SNOWMAN, MAD MONSTER PARTY, SANTA CLAUS IS COMIN' TO TOWN. Beautifully illustrated and written. Exhaustive book on non-sport trading cards...over 500 pages! Color images of cards...thousands of cards and card sets. 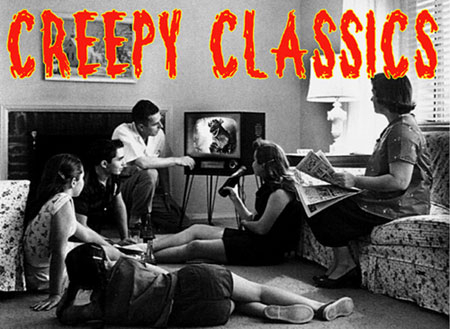 1985-2006...MUNSTERS, MONSTER MOVIE CLASSICS, SATURDAY SERIALS, GODZILLA...it just goes on and on. Packed with images, descriptions...alphabetical reference. New book. The complete Mart Shelley classic novel FRANKENSTEIN. Plus, detailed annotations, background, historical information along the way. Beautiful pen drawing illustrations throughout. Includes a reproduced hand written page by Shelley herself. An amazing, interesting volume! By Tom Weaver. Large Book - 373 Pages. The march of the monster movie makers continues in Tom Weaver's ninth book of in-depth interviews with the men and women who made the horror and sci-fi favorites of the 1940s, '50s and '60s.